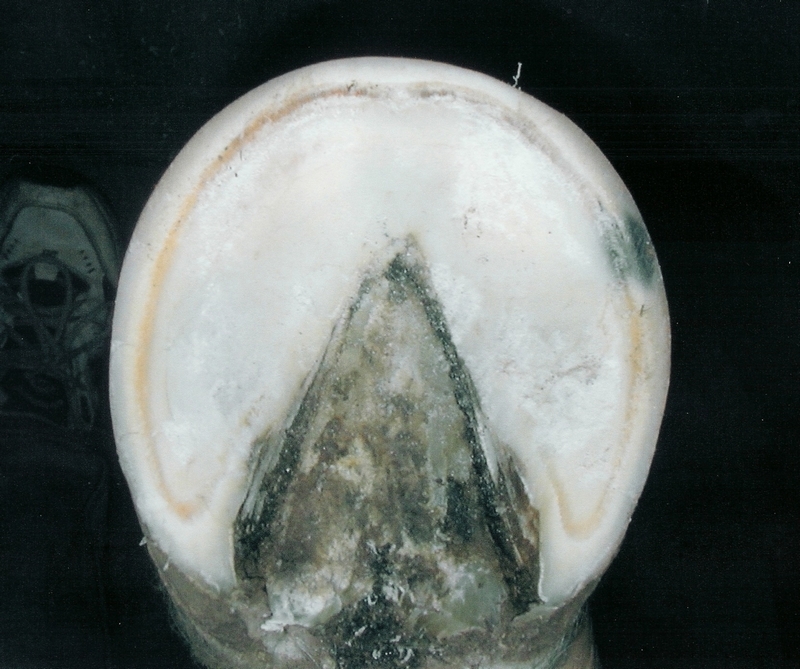 It is this last problem of FLARES that causes most lameness problems associated with the hoof. The guideline is that a flare anywhere in the hoof is your greatest enemy. For example, the pigeon toed horse develops a flare on the inside toe quarter, resulting in the diagonally opposite heel (or the outside heel) becoming crushed and rolled forward. This can result in a stress crack above that heel and a flare to the inside heel. (Pic 1 and 2) To correct this, we often tend to build up that low outside heel, but in fact we should reduce the flare diagonally opposite which has caused the problem. 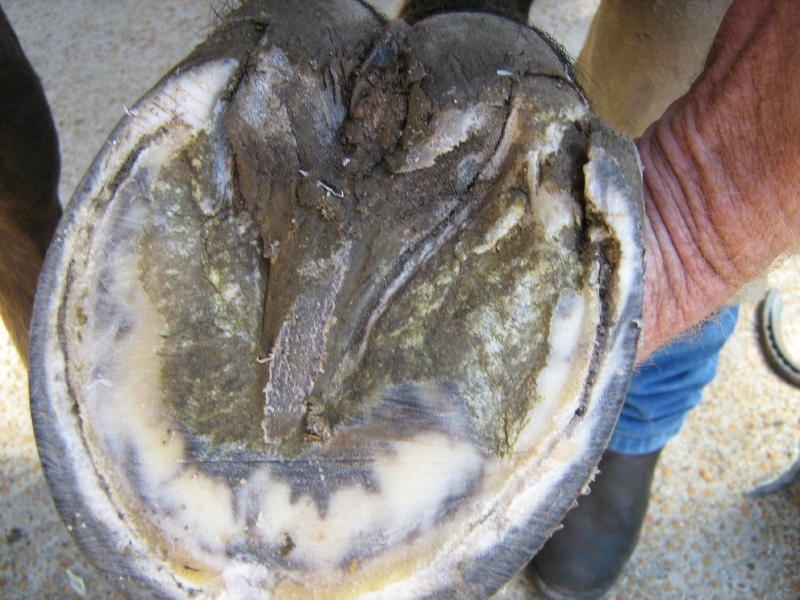 The resolution may be to completely remove the separated area of hoof capsule and fit a supporting bar shoe to allow the hoof to recover without pressure in the affected area. Impact related stress cracks appear horizontally below the coronary band; they may either be in the heel area, or in the toe area. Once again they are the result of imbalance in the hoof. 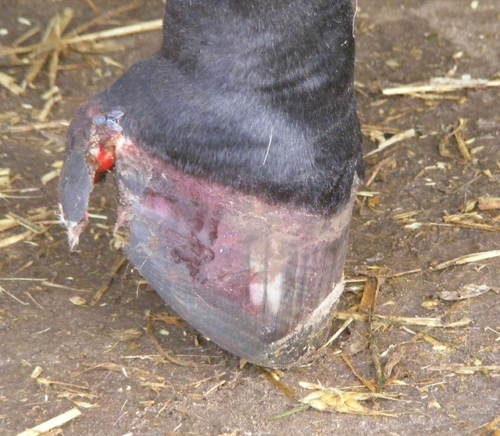 High heels cause the concussion in that area due to the hoof landing too early, before the leg is completely straight. 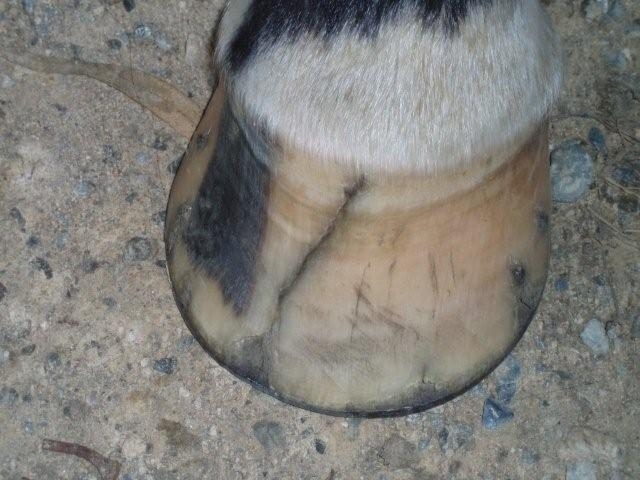 Horizontal cracks in the front of the hoof may also be caused by high heels, causing short toes which result in the flight of the hoof breaking over early, travelling too high, and landing very short with high impact. 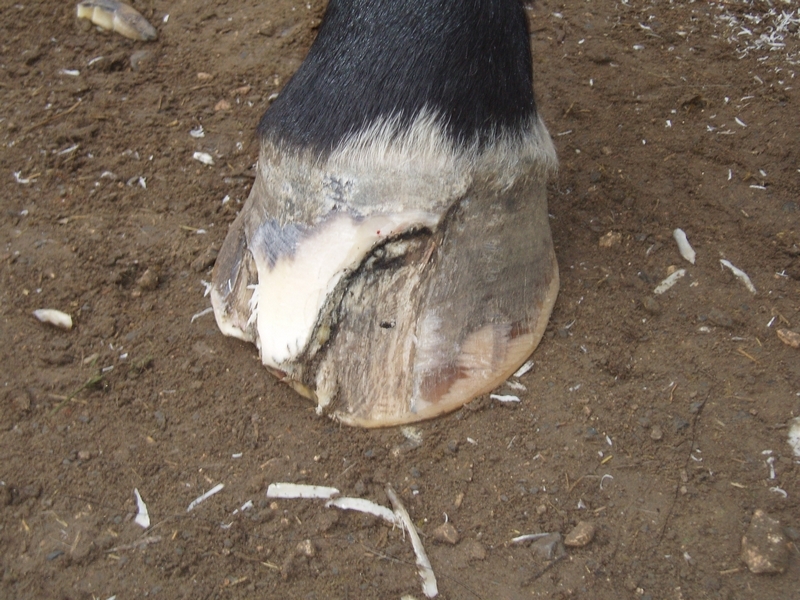 This is often the resultant effect of horses shod with square toed shoes or trimmed with squared toes. 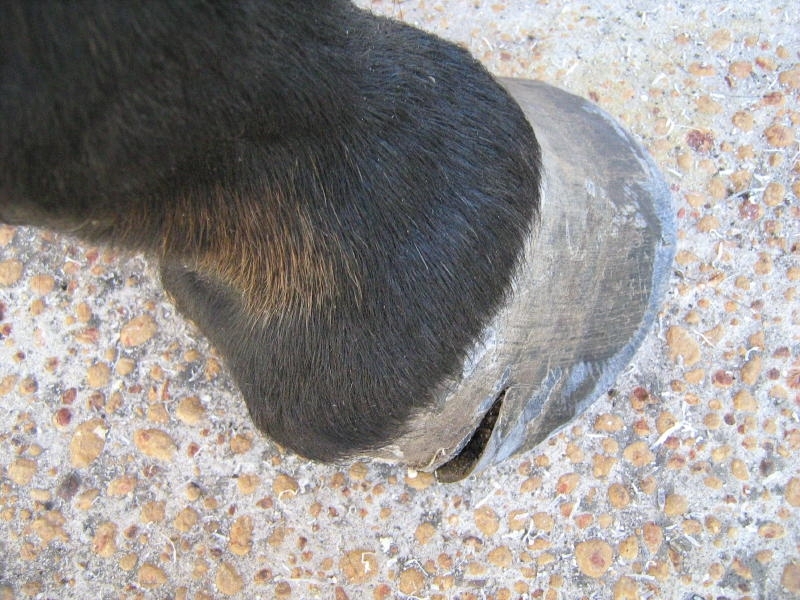 Many quarter cracks are a result of pressure caused by imbalance in the hoof which is usually diagonally opposite the affected area. (Pic 3) Again, the resolution of a quarter crack may be to completely remove the separated area of hoof capsule and fit a supporting bar shoe. Impact related quarter cracks are always the result of flares at the heel. In Pic 4 we see the distorted heel height caused by a deviated pastern. The flare will always reoccur in the direction of the deviation. Left unattended, these horses are at great risk of the hoof quartering at the heel. The resolution of this is to trim the heels to a level T-square in line with the deviation in the pastern, thus allowing the heels to land level without excessive pressure. 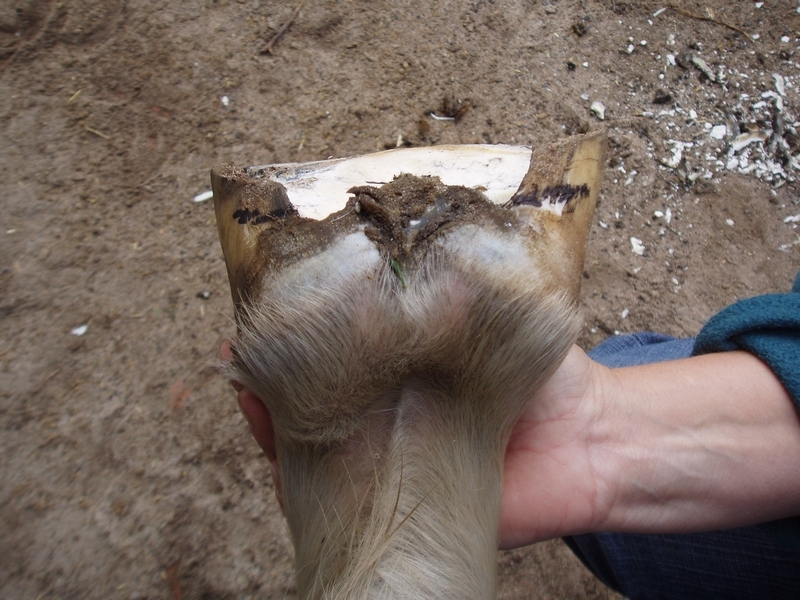 Toe flares cause cracks (Pic 5) resulting in hoof wall separation progressing to an abscess and then to Seedy Toe. (Pic 6) This will be a long term lameness problem requiring a high degree of care and attention. The resolution of all these problems is to not allow flares to develop in any part of the hoof, even on a crooked legged horse. Pic 7 shows an even hoof wall thickness which is stress free and will eliminate at least 90% of hoof related lameness problems. It IS possible to achieve an even thickness of hoof wall on ANY horse.